Home › EPOCH DAWNING: YOUR WILL, YOUR FUTURE, YOUR FATE, YOUR WORLD. Get the best selling Christian Sci-Fi Thriller on Kindle! Epoch Dawning version 2.0 is here and contains a brand-new secrets section! Unlock the mysteries of all the symbols, learn the significance of numbers, and immerse yourself in the story behind the story encrypted within the book. Enhance their understanding of faith versus reason. Boost curiosity and provide the mental fuel for discerning the meaning of existence. Expand their knowledge by harmonizing what is known about biblical history and scientific facts about the universe. Intensify their sense of purpose, and strengthen their devotion to belief. If technology gave Adam and Eve the chance to start again, what would they choose to do? In the future, the Singularity exists. Did it decide that humans are a threat, or that we could be put to better use? Is life pre-determined, or are we in full command of our own destinies? All of these questions will be answered and more in the groundbreaking new novel, Epoch Dawning. In 2089, when two people inadvertently become the contemporary Adam and Eve, they are faced with the unfathomable choice to rebirth humanity—or terminate life altogether. 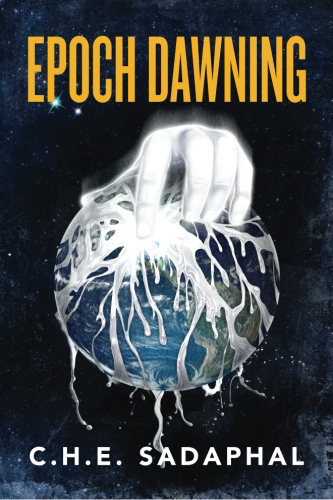 Epoch Dawning follows the paths that lead cynical genius Asher Grant and steadfast Evelyn Coble to their unwanted roles as the last man and woman on earth. Asher and Evelyn’s fates are a byproduct of the destruction of the “Collective”. The global network of consciousness connected the minds—thoughts, intentions, and desires—of every human being. But when the network was compromised, every person linked to it perished. Asher and Evelyn were the only two people (or so they thought) in the world who were not plugged in. Asher Grant survived the apocalypse on board a spaceship heading for an international space colony. He had not planned on returning. After the death of his wife and son in a car accident, Asher could no longer see the light in life. His extraordinary intelligence had always been both a burden and a gift, but it was inconsequential in saving his family. He wanted to die, but had instead become the last living man. The irony did not amuse him. Now drowning in grief and completely uninterested in his Eve, Asher is hell-bent on choosing extinction. Evelyn Coble survived the apocalypse in an underground shelter after a confrontation with the very man who ended the world and then took his own life. If Evelyn had not long ago repented and dedicated her life to goodness, she would not have been there with him at all. But Evelyn had worked hard to overcome her demons and to forgive herself for that horrific night behind the wheel of her ex-husband’s SUV. Now Evelyn can turn only to her convictions in attempt to convince Asher that life is worth living—and the world worth repopulating. This innovative novel began as a vehicle that attempted to explain “the gap theory” but soon developed into a far-reaching story that encompassed the realms of science fiction, speculative fiction, fate, spirituality, purpose, love and human nature. Epoch Dawning will open your eyes and challenge your perception of reality. For two sample chapters, click here. Click here to purchase the book in print and here for the E-Book (Kindle). Goodreads: For my author page, click here or go to the EpoD page. AUTHOR Q & A WITH C.H.E. SADAPHAL. Q: What value does the book have for fiction readers? In essence, the reader is given the power to look into the future and decide if what they see is the future that they want. And, like Asher and Evelyn in the book, with that power, the question now becomes what you will choose to do with it. Your life experiences, beliefs, and personality will all shape how you choose to move forward. Our society, obsessed with surveillance, data, and information, is going in a certain direction and Epoch Dawning portrays a reasonable extrapolation of where the world will end up if things get a bit out of control. For anyone who enjoys tales about dystopian futures, the apocalypse, conspiracy theories, egotistical geniuses, the NSA, government control, the Singularity, terrorism, the power of technology in our lives, or existentialism, then this book is for you. A colleague and I were shooting the breeze one day and we somehow ended up sidetracked into a series of heavy philosophical questions. The conversation was so intriguing I had to write some thoughts down on paper. One page turned into another, and after a while the process became addictive. Specifically, I’ve always felt that nowadays, those who tend to shun reason, reject intellect, and use rigid, outdated models of theology for practical application in a very progressive world have hijacked the conversations on faith and religion. There are core pieces of doctrine that we all should hold in a closed hand that represent the irrefutable truth. In the other open hand, there are things that we may not have an exact answer for, but these superfluous entities should not serve to divide individuals who all have the same goal in mind. The power of the truth is that it’s mutually exclusive, yet at the same time how we apply and practice that truth can often speak louder than the message itself. Q: Where did the idea of The Collective come from? Other forms of media have described an all-powerful controlling form of artificial intelligence, like Skynet from the Terminator movies. But, the main difference is that the Collective is as much human as it is machine. In fact, without humans, the Collective could not exist, and therein lies the construct’s central paradox—the system is so pervasive, powerful, and intrusive only because of humanity’s active participation and submission to it. Without the human element, the system would be impotent. I think there’s a unique lesson there for anyone who may place a lot of stock into particular somethings in their lives. Q: You make heavy use of symbols and images in the book. Tell me more about that. I think that in general, people best understand a message when it’s told in the form of a story, or a parable they can relate to. That way, you can inject a sense of interpersonal dynamics and emotions that all people have a sense of. When writing Epoch Dawning I purposefully wrote the text on two levels, so that there’s a superficial story than can be read literally, but underneath that tale, another story also exists, describing its own separate narrative. Anyone who purchases the updated version of the book will receive information on how to unlock many of the secrets, symbols and puzzles encrypted into the text. The book leaves no room for a sequel per se but at one point I did flirt with the idea of writing a volume on what happens after the end of the book, which would essentially mean creating a whole new universe from scratch. Where would I even start? Another idea would be a prequel that would describe how the world went from where we are now to the world of the Collective. The only question would be what appealing stories to include for a sci-fi book. Really, you could write thousands of pages describing what happened to different people, friends, families, lovers, politicians, rebels, visionaries, and organizations leading up to 2089. Yes I am working on two new books: the first is a fantasy-adventure that will help readers to learn how to overcome their inner shadows an embrace what they’ve been truly called to do. It’s set in a mythical realm and involves a character that ends up in a strange place, is given extraordinary abilities and talents, but must decide how to use them. The other is a non-fiction book that I believe will help readers to perfectly harmonize their faith with reason. By analyzing what we know about the universe, it describes the intellectual, scientific and philosophical approach to make a powerful final conclusion—that not only does God in fact exist, but He also left clues to exactly who He is. It’s up to us to take the leap of faith and choose wisely.